BEANPOLE ruckman Tim English has declared he's now equipped to assume the No.1 mantle at the Western Bulldogs after breaking into triple figures on the scales this summer. 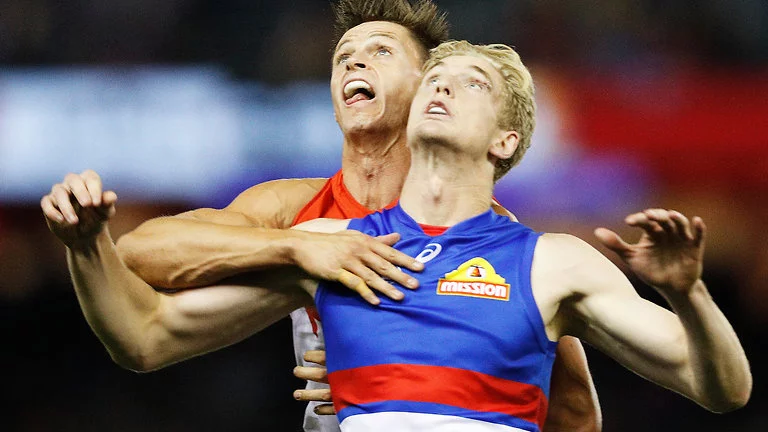 With concern around Tom Boyd's back injury and the departure of big men Jordan Roughead and Tom Campbell, the 21-year-old appears poised to be the Dogs' first option in 2019. Now enjoying his first full pre-season ahead of his third year at Whitten Oval, English believes he's ready to cement his spot against the competition's leading ruckmen. "Hopefully I can move into that No.1 ruck spot," English told AFL.com.au. "It'll depend on whether two ruckmen play or how the team ends up, but I'd love to play wherever the team needs me, whether that's in the ruck or attack. "The running aspect is a big one, covering more kilometres has been important. The gym side of things has helped and obviously putting size on is still a big goal for me. "Being able to do that without any hiccups or interruptions has been great. "I'm sitting at about 100kg at the moment and I think I came to the club at 89. I've put on a fair bit since I've arrived, it's probably been 3-4 each year so it's good to actually see that development's coming in." After overcoming hip surgery to play the first seven games of 2018 and take his career tally to nine, English failed to play another senior match for the season after he was dropped ahead of round eight. While a foot injury in May hurt his chances, the West Australian product was forced to develop in the VFL as Boyd, Roughead and Jackson Trengove shared the responsibilities in the AFL. With Trengove set to play predominantly as a forward this season after his debut year at the Dogs as 'Mr Fix It', English has also worked on his contested game to provide an option in the front half. The pair have been switching between ruck and attack during match simulation this summer, and English said Trengove had been crucial with his hands-on teaching. With Boyd set to miss round one, English's only threat appears to be mature-age recruit Jordon Sweet, who has arrived ready-made from North Adelaide in the SANFL. Despite the Dogs re-shuffling their ruck stocks during last year's exchange period, English insists he was never considering a move back home. He was the subject of trade murmurs as West Coast and Fremantle chased talls, despite being contracted until 2020. "I knew that I wasn't going anywhere, I'm contracted at the Bulldogs and I don't see myself leaving," he said. "I'm really enjoying my time in Melbourne. "I talked to (managers) Colin Young and Andrew McDougall and they've been very good with me and we were very clear with what we were doing, and that was obviously staying in Melbourne." I really rate English and hope he stays for as long as we can hold him. I reckon he is already underrated by a lot of pundits out there! Yes please. He is the most talented ruck on the list and his potential is huge. He hasn't played 10 games yet, but is one of our most important players. I hope he has a good season, but I hope he doesn't get crushed by the weight of expectation we're going to heap on him. To me, English is the cornerstone of the next decade. Our universe revolves around him. That’s not too much pressure is it? I concur. 2nd best talent on the list after Bont. English's father's frame is big not just tall so young Tim who resembles his father is destined to be bigger. The extra kilos are not unnatural so the extra weight is not going to stop his mobility. Mind you Kelvin Templeton was skinny as until built up to Superman in the gym and it didn't affect his ability to lead or be mobile.